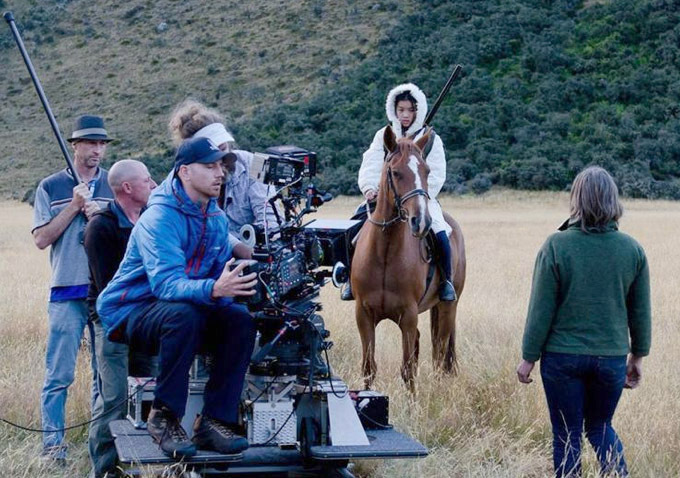 A year ago, I shared the news that award-winning film director Jane Campion (The Piano, Bright Star) was helming a mystery thriller TV mini-series set in and around Queenstown in the beautiful Southern Lakes area of New Zealand. "Top of the Lake" stars some terrific actors, including Oscar winner Holly Hunter (Saving Grace, The Piano), Elisabeth Moss (Mad Men), David Wenham (The Lord of the Rings), Peter Mullan (Trainspotting, The War Horse) and several other familiar faces. In early reports, Campion said about the project that: “It’s a detective story that’s very much influenced by the landscape around Glenorchy and explores ideas about paradise and community". From its first scene, what sets this production apart is the gradual pace at which the story unfolds. Notice I didn't say slow. That might suggest Campion and Davis's results are boring, but instead watching Top of the Lake feels like reading a great mystery novel where rather than a strong visual introduction that succinctly clues audiences into a particular character's stereotype, we're offered just a bit of information here and there, forced to stitch together what we discover. This is how the town and its residents are knit together. And its creation is masterfully done, offering a new puzzling bit of info just before the credits roll for a given episode. It also thematically fits this world, where everyone has something to hide. More and more over the past few years I've thought that much of the pinnacle of screen storytelling has been happening in television (particularly cable television) rather than film, with many terrific, multi-layered, television series where characters, plots, and themes can unfold in a twisting and unexpected fashion over time. I'm looking forward to seeing whether "Top of the Lake" continues to bolster this trend. The early signs are very good. From what I can gather, "Top of the Lake" will screen on the Sundance Channel in the US, and on UKTV in New Zealand, kicking off in the next month or two in each case. Depending on your location, you can view a trailer for the series here. Thanks, Craig. This sounds great and I will look for it in the U.S. if I can only remember to at that time. This sounds very interesting. I hope it shows up on DVD sometime soon. I agree with you that the TV miniseries format offers more flexibility and freedom to do a more complex treatment of a work than will a film version. Just thought I would let you know that Netflix has it listed in its SAVED category--available some time in the future. It's in my queue now. We don't get the Sundance Channel here in Canada,though I will be keeping my eye out for this. It sounds really good! Thanks so much for posting about it. Certainly in regards to mystery movies vs tv mysteries (for lack of a better term), the mysteries being done for tv far outshine anything the movies are doing. In fact, I can't remember the first original mystery movie done in the past few years in movie form, can you? That is good? Whereas for tv, there are so many.